Every teacher wants to see her students improve. But measuring that improvement may be more difficult than it seems. Over the past 15 years, No Child Left Behind and other federal policies have given special prominence to one primary measure for assessing student progress: the so-called percent proficient measure. With this metric, educators can track the percentage of students in a class, school, or district who are “proficient” (scoring at or above a certain designated baseline), with hopes that this percentage will eventually rise to 100. The animation above illustrates the point. If we imagine the usual “bell curve” of students, some states can set a high standard, resulting in relatively low percentages of proficient students, while other states can set a low standard, resulting in relatively high percentages proficient. The difference between these percentages is arbitrary, says Ho. Aside from distorting comparisons between states, percent proficient can distort perceptions of growth within a state, or district, or classroom. States or schools with 50 percent proficient — the top of the bell curve — will have more students performing right around the proficiency marker. If those students make progress (or if they regress), more of them will cross the proficiency line than if the cutoff were more extreme. When you chart those student scores, the number of students reaching proficiency appears to accelerate or decelerate rapidly — as if the class has made significant gains or losses. But the appearance of that rapid or meaningful change is an illusion, Ho says. The third problem, Ho explains, raises concerns about achievement gaps — for example, average differences between test scores of white or higher-income students and minority or poor students. When comparing two groups of students, whichever group has percentages closer to 50 percent will appear to progress or regress faster, leading to assumptions about changes in the achievement gap that are incorrect — another illusion. Ho began this research back in 2008. Why is it still significant now? With the push toward “college- and career-ready standards,” Ho explains, many states have raised standards, making “proficient” a more difficult level to achieve and causing percentages of proficient students to fall. Under this system, achievement gaps often seem to widen. Meanwhile, the increase in standardized test usage has teachers, not just superintendents and policy workers, more closely analyzing students’ scores, risking more widespread misinterpretations. For most classroom purposes, Ho suggests, tests should be able to answer two simple questions: “Should I be worried?” and “If so, what should I do about it?” Any time a teacher has a class whose percent proficient is near 50, she should expect relatively big swings in percent proficient after a test. All it may take is a little extra studying and concentration (or a little less) to make most of the class “proficient” (or “not proficient”). These swings are not necessarily anything to worry (or get excited) about; they likely represent only a tiny change in overall student scores. On the other hand, a teacher with a class closer to 90 or 10 percent proficient — a very high-achieving class or a very low-achieving one — should pay close attention to small swings. These small swings are actually important, indicating large numbers of students moving near the middle of the distribution. That is why, for most teachers, a better method is simply to compare average scores from one test to the next, as opposed to analyzing percentages. This practice gives a more accurate picture of student achievement, encourages teachers to expand their focus beyond the students who happen to be close to the cutoff, and improves identification of students who are falling behind. 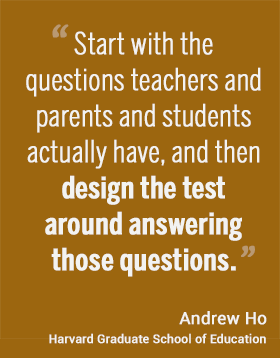 Most importantly, tests should also be able to answer the “what should I do about it” question. Ho contends that if tests “don’t give anyone any insight into what can be done about them, then they’re not much of an achievement.” Tests, he argues, should be faster in terms of both time to complete them and time to receive scores, more curriculum-relevant, and more teacher, student, and parent-friendly.